Callaway Rogue Steel 4 Iron. Model Rogue. Flex Stiff Shaft. Shaft Material Steel. Head: 7 - Good Shaft: 8 - Very Good Grip: 8 - Very Good. Club Type 4 Iron. 5 Well Used Shows heavy signs of use, nothing to affect performance. Shaft - Callaway 75g. Grip - Callaway. Shaft Flex - Regular (R). Club - 4 Iron. Shaft Condition - 8 Excellent. Callaway X Tour Forged. Lincs Golf. The speed and distance of Steelhead XR Irons is based on the next-generation 360 Face Cup™ technology, which allows the edges of the ultra-thin face to freely flex and release at impact with greater efficiency, adding ball speed that promotes more distance, especially on off-centre hits. THATS 10 6 IRONS RIGHT HAND. PERFECT FOR PRACTICE CLUBS AND A BARGAIN PRICE. STIFF FLEX 6.0 X4. FIRM FLEX 5.5 X3. REGULAR FLEX X3. Callaway Diablo Edge 8 Iron in good overall condition. Callaway Diablo regular flex steel shaft . Callaway grip in very good condition. All pictures are of the actual club for sale. Callaway Golf X18 9 Iron in good overall condition. Callaway X18 uniflex steel shaft. Golf Pride Tour wrap grip in good condition. All pictures are of the actual club for sale. Callaway XR OS 9 Iron. Shaft: project x pxi 5.5. Model: x hot pro 5 iron. Flex: regular. Shaft Material: steel. We're rated 5/5 for service! We specialise in the sale of affordable new golf balls and lake golf balls. Other deals available include a wide range of clearance apparel, footwear and accessories. # Callaway XR Project X 5 iron - 37 " approx. Callaway Steelhead Pro Series X16. Callaway X18 5 Iron in good overall condition. Callaway Gold X18 uniflex steel shaft. Callaway grip in usable condition. All pictures are of the actual club for sale. 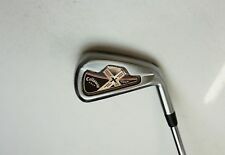 Callaway X Series N415 5 Iron. Callaway X18 7 Iron in good overall condition. Callaway Gold X18 uniflex steel shaft. Callaway grip in usable condition. All pictures are of the actual club for sale. Callaway Black X24 Hot 4 Iron. Please note the club has very minor pitting on the shaft otherwise it is in very good overall condition. Callaway X Hot Uniflex steel shaft. Original Callaway grip in excellent condition. All pictures are of the actual club for sale. Callaway Big Bertha grip: 7/10. Callaway Fusion Wide Sole 5 Iron. Callaway X 20 Tour. Lincs Golf. Ladies Callaway XR Cup 360 9 Iron. Callaway Golf X2 Hot 7 Iron in very good overall condition. True Temper Speed Step 85 stiff flex steel shaft in very good condition. Golf Pride Tour Velvet grip in excellent condition. All pictures are of the actual club for sale. Callaway X Tour Forged 3 Iron. New Price - Callaway Big Bertha 7 iron & Mamiya Recoil "F3" Reg. Graphite Shaft. The UST Mamiya Recoil 660 Regular Flex F3 shaft itself is in mint condition as is the Callaway grip. The UST Mamiya Recoil 660 Regular Flex "F3" graphite shaft is 71grams with mid torque and a mid/low kick. Titleist AP2 714 Irons 4 to PW Dynamic Gold R300 shafts GolfPride Tour Wrap 2G grips These irons are in mint used condition....they have always had iron covers on them so there is hardly any ‘iron clatter’ markings on them at all. You really will struggle to find a better condition 2nd hand set online....especially when you take into account that the irons are much harder to get hold of in regular flex shafts. Please don’t insult me by trying to put an offer in for them as it will be refused. Do yourself a favour and save well over £600 compared to buying a new set of 718’s. Buy with confidence....being sold by a PGA Pro with over 25 years under his belt. Callaway Graphite Shaft - Light Flex, 75g, Low Kick. Callaway X-Series Iron. Standard Callaway Grip. Fitted with a Project X 5.5 Regular Flex Graphite Shaft. THE CLUB BEING SOLD IS A 5 IRON . Your parcel will arrive hassle free, quickly and with regular updates. Callaway Big Bertha 6 Iron. UST Recoil Ladies Flex. Callaway Ladies Grip. X Forged UT CF18. KBS Tour 105 X flex steel. Golf Pride Tour Velvet Reminder. Head - 10, shaft - 10, grip - 10. Standard 4 iron length.